Allow me to thank Elaine Bennett, (When is lighting going to be installed?, November 18) for her kind words regarding me getting the lights installed into Croft Road Recreation Ground. In reply to her question about when the promised low level lighting is going to be installed at the section of the footpath/bicycle track connecting Croft Road Rec to the University Parks Cycle track at the bottom of Ferry Road – I promise to pursue this issue as soon as the funding is made available and the lighting acceptable to the residents in Purcell Road. COUNCILLOR Mick Haines must be over the moon as after years of campaigning to get lights installed in Croft Road Recreation Ground, they have actually been put in place at last. This will make it much safer for all who use the cycle track/footpath in the hours of darkness. The track across the recreational ground and behind Wadham Park complete with new bridges, all credit due to Councillor Mary Clarkson, are a million times better than the old gravel track full of muddy puddles. An Oxford city councillor’s campaign to get lights installed in a Marston park has come to fruition after a seven-year battle. 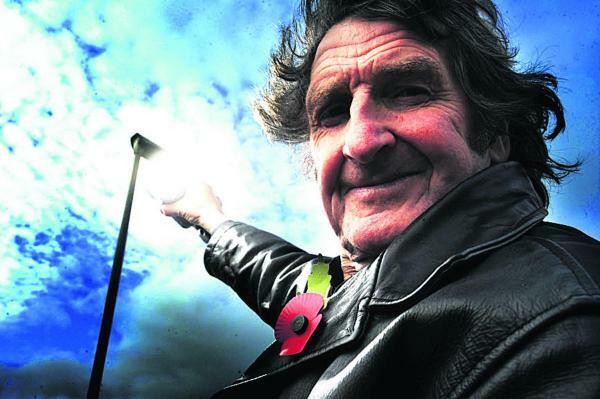 Mick Haines, who represents Marston on the city council, has been campaigning to get lights put up along the footpath in Croft Road Recreation Ground since 2007. And 10 lights were finally installed in the park on November 5, to Cllr Haines’ delight. “I’m really pleased for me and for all the people who signed the petition,” he said. Oxford City Council gave the lights the go-ahead in July last year, but delays meant they were only installed this month. The news comes after Cllr Haines travelled to Downing Street in 2010 to deliver a petition of more than 1,200 signatures in favour of the lights to prime minister David Cameron. Cllr Haines added: “It’s been a long, long battle for seven years, but it proves in the end it can be won if you fight long enough for it. A statement released by the city council said: “Installation of the lights commenced on November 5 and they should be operational this week. 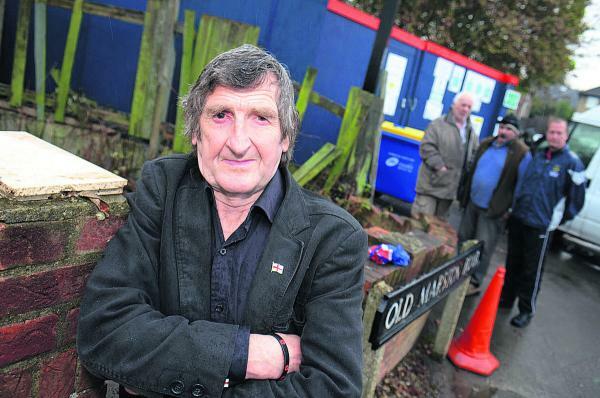 TESCO has removed hoarding that was blocking a footpath in Oxford for the second time after complaints from residents. It pushed back the hoarding around the former Friar pub – set to become a store – in Marston this week. The hoarding had blocked the footpath, which links Old Marston Road and Marston Road, last year, but it was moved in February after complaints. But, having moved it away, the firm later moved the hoarding back. Mr Haines was among those who complained to the supermarket giant, which moved the hoarding on Wednesday. He said: “It’s absolutely brilliant. I’m so pleased we can use it again. It’s definitely a victory. Tesco won council planning permission to turn the site – on the corner of Marston Road and Old Marston Road – into a Tesco Express store in 2011. The site was bought from restaurateur Clinton Pugh after he failed to develop a cafe and flats on the site. Tesco last year moved to quash concerns trees planted there in 1950 in memory of Second World War dead would be removed. Mr Haines said: “This piece of footpath is a piece of Marston history. “I think it’s disappointing that they have left it this long to start building it because the residents don’t know what exactly is happening. Mr Haines added: “We have got shops already, exactly where Tesco is. Tesco, which this week admitted it had overstated its guidance for half-year profits by £250m, failed to respond to requests for a comment. A MEMORIAL tree could be planted to honour a dedicated parish councillor and long-serving bellringer. Roy Jones, who died in May aged 78, served on Old Marston Parish Council in the 60’s and 70’s and again for several years until his death. Now, Oxford city councillor for Marston, Mick Haines, wants to honour the former St Nicholas Church bellringer. He has already drummed up support from Mr Jones’s sister, Sylvia Price, and proposed the idea to Old Marston Parish Council. Mr Haines said: “I didn’t know Roy for long, but in the short time I knew him he was a really brilliant councillor for the village. The project would cost about £180, which would be met by Mr Haines’s annual community fund. Proposed sites for the tree include Mortimer Hall Recreation Ground, in Oxford Road, and by St Nicholas Church, in Elsfield Road, where Mr Jones started ringing bells when he was eight. Mr Haines said: “I would love for it to go in the churchyard because he was dedicated to the church. Mr Haines added that the memorial could be a willow tree, in tribute to a poem Mr Jones wrote while he was a student at Magdalen College School. Mrs Price mentioned the poem to Mr Haines when he approached her about the idea. The 68-year-old, of Ousley Close, Marston, said: “He asked what tree and I said it could be a willow tree. Mrs Price, a retired hairdresser, added: “I think it’s a lovely gesture and that Roy deserves it. Marston Parish Council chairman Charlie Haynes said it would seek advice from Oxford City Council about the type and size of tree to plant. He said: “I can’t see a problem planting a tree in memory of Roy Jones. So dedicated was Mr Jones to bellringing that there were fewer than 20 towers of five or more bells across the country that he had not rung. He worked as a pharmacist and teacher, and became bell tower captain at St Nicholas after he retired in 1990. When is lighting going to be installed? Well done to Mick Haines, Marston’s Independent city councillor, who has been successful in his campaign regarding lighting through Croft Park Recreation Ground. Oxfordshire County Council’s recent installation has provided a safer access. I would like to know when the promised low level lighting is going to be installed at the section of footpath/bicycle track connecting Croft Road Recreation Ground to the University Parks Cycle track at the bottom of Ferry Road. This stretch behind Purcell Road along the ‘cinder track’ is dark and narrow for everyone accessing this area when it is dark. CELEBRATIONS were in order after a seven-year battle to illuminate a Marston park finally came to an end. Independent city councillor for Marston Mick Haines said lights for a cycle path in Croft Road recreation ground were installed last week. He said his fight began in 2007 after plans between Oxford City Council and Oxfordshire County Council to revamp the community area. He added: “This has been the icing on the cake. It’s been a hard struggle, seven years of a hard struggle. “It’s been very difficult. I have had to push and push and push and keep on about it. “I’m very pleased for the residents that at last we have got them. “But we deserved them, we seem to be behind in Marston with getting stuff done. Mr Haines said his campaign for the new lights began after concerns about resident safety. In September 2010, he delivered a petition to Downing Street signed by more than 1,200 residents to raise awareness of the issue. He added: “It’s the safety aspect. In August the Oxford Mail reported the city council expected the lights to go up by the end of September but they were only put up last week, according to Mr Haines. He said he believed there had been delays with supplying the lights. A PETITION of more than 1,000 signatures from Old Marston residents calling on council chiefs to tackle parking problems has been handed in. It calls on Oxfordshire County Council to put in place parking restrictions Monday to Friday to tackle parking from Oxford Brookes University students. 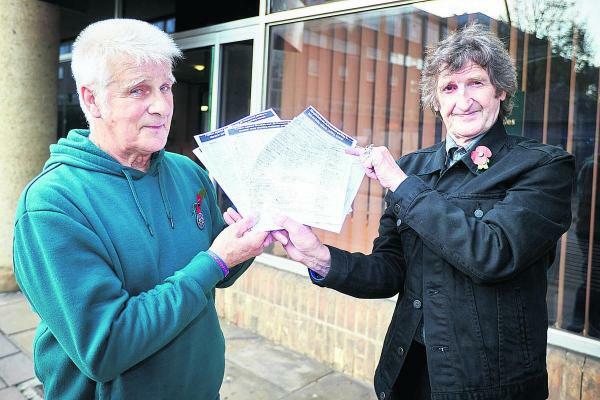 Oxford City Council member for Marston Mick Haines presented the petition with 1,003 signatures to highways officer David Toll on Thursday. Mr Haines said he has discussed with Mr Toll a survey of residents’ views. University spokesman Tom Smith said: “The university shares their concerns about the challenges of parking in Marston and the impact it is having on residents. 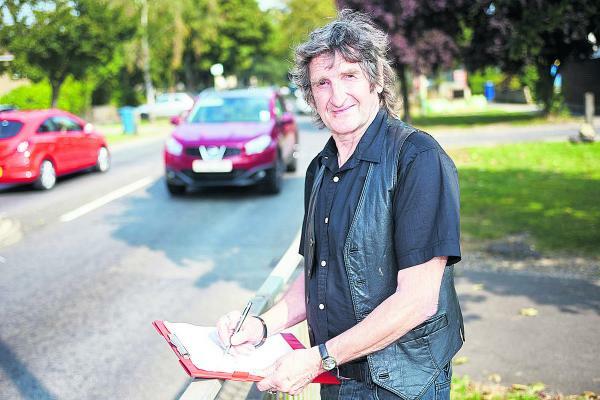 A MARSTON city councillor has been carrying out his own traffic surveys in an attempt to prevent congestion problems. Mick Haines, of Croft Road, is concerned the proposed Barton Park housing development will cause gridlock traffic in Headington and Marston. 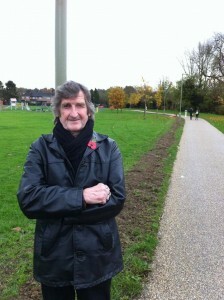 He hopes his surveys will highlight to developers Grosvenor Developments the issues residents in both areas could face. Mr Haines said: “No one else has done these surveys at all but I think they are really important. More than 800 homes are planned for the new development, which will extend the Barton estate to the west. It will also include new shops, a primary school, community facilities and a sports pavilion. Construction is expected to start in 2015 after planning permission was given last year. Mr Haines said developers needed to provide additional infrastructure to cope with the demands of extra homes before construction began. This year Mr Haines has single-handedly conducted four traffic surveys. His latest survey, held last Thursday in Marsh Lane, recorded 1,890 cars and vans, 20 lorries, 39 motorcycles, four buses and 14 cyclists passing through between 7.15am and 10am. His June survey noted 17 fewer cars and vans, 44 lorries, 33 motorcycles, eight ambulances, 15 cyclists, two tractors and two coaches passing along the road. He also conducted a two-hour survey within Old Marston Village on May 12 from 7.15am, where he recorded 624 cars and vans passing through and 110 cyclists. This increased to 722 cars and vans, five lorries, seven motorcycles and 81 cyclists on Monday, September 15, at the same location. Mrs Haines said: “I got quite a shock, honestly. I thought the village would not have quite as much going through as they had, or Marsh Lane; I was absolutely flabbergasted. I couldn’t believe how much traffic came through. “The traffic situation is really horrendous in this area. He plans to present his results to Oxford City Council planning officers and Oxfordshire County Council officials. Earlier this year more than 500 residents voiced their concerns and signed Mr Haines’s petition to tackle traffic problems in the area. More than 900 also signed his petition to tackle sewage and flooding issues. Mr Haines also wants a sewage station constructed at the Barton Park site to deal with any waste issues.